On an island in the marsh, just north of Fort Snowhawk, west-northwest of Morthal. 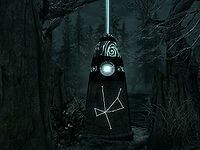 The Apprentice Stone is one of the thirteen Standing Stones scattered across Skyrim. Those under the sign of The Apprentice recover Magicka faster, but are more susceptible to Magicka damage. Activating the Apprentice Stone increases magicka regeneration by 100% and increases weakness to magic by 100%. The stone is set in the typical arrangement of standing stones on the northeast end of a small marsh archipelago. Little else is found here other than plants typical to the marshes of Hjaalmarch. A deathbell plant is growing just to the west of the stone structure, at the base of a large tree. Another is at the base of the Apprentice stone itself. 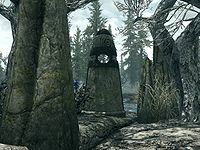 Swamp fungal pods are also growing in the stone's circle and more can be found at the base of a tree just to the right of the circle of stones. A nirnroot is found on the shoreline to the southeast of the circle. Although the loading screen tip states the Apprentice Stone doubles both magicka regeneration and magicka, only magicka regeneration is doubled. East-southeast of the Stone, a Nordic burial pit has partially sunk into the swamp, and has been taken over by several mudcrabs. A treasure chest, several burial urns, and a copy of the Lockpicking skill book The Locked Room can be found here.